I'm so honored that you all voted for my "Kitchen On The Go" project for SYTYC's Week 3 submission! In this tutorial I'll show you how to make two different types of reusable bags: the sandwich bag and the snack bag. Let's get started. First, prep your plastic bags by cutting the left and right sides and top off of each to make two large sheets of plastic. Set one aside. We'll make the sandwich bag first, so you'll need three pieces of fabric. 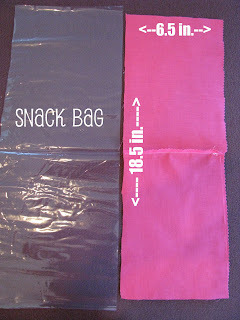 The main body of the bag is 6.5 inches by 18.5 inches and the two sides are 2.5 inches by 5.5 inches. Rough cut 3 pieces of plastic out of one of your plastic bags so that each piece is about 0.5 inch larger than the fabric on all sides. It doesn't have to be perfect because you'll be trimming it later. Place one of the fabric pieces on top of its corresponding piece of plastic (with the right side out) and secure it with a few pins. Stitch around the outside edge of the fabric with 0.25 inch seams. Repeat this process with each of the three pieces, then trim the excess plastic. Fold the seams down once (0.25 inch) and then again (0.25 inch) so that there are no frayed edges showing and all are tucked under. (This will take up about 0.5 inch of your project on all sides.) Secure with pins and then sew down. Repeat this process for all three pieces of the your sandwich bag. Next, lay your project out like the picture below. The piece closest to you in this picture is going to be the front flap. Attach both of the sides 2.5 inches from the point closest to you. Only sew down the right seam for the right side and the left seam for the left side, we'll attach the other parts of the sides later. Fold the front flap under the two sides and sew again along the left and right seams. Now the bag is starting to take shape! Fold the sides out and sew the bottom. This is what it will look like from the inside. And this is what it will look like from the outside, the seams are out. Continue sewing the side of the bag to the back flap using the same technique. When you're all done the inside will look like this... all covered in food-safe plastic and ready for your sandwich! The snack bag doesn't have side flaps, so its construction is much quicker. 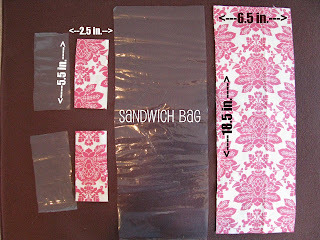 You'll need a piece of fabric 6.5 inches by 18.5 inches (same size as the main piece of the sandwich bag). Again, you'll want the plastic to be about 0.5 inch larger on all sides. With the fabric on top of the plastic, sew 0.25 inch around each of the edges of the rectangle, then cut the excess plastic just as before. Getting deja vu yet? Fold and stitch the edges all the way around. Fold the rectangle so that there is a 2.5 inch space from the back flap to the top of the front flap. The front flap will be folded down 2 inches, like in the picture below. Sew the sides along the existing seams on the right and left sides and you're all done. The sandwich and snack bags close just like the old sandwich bags, pre zip-lock. Just turn the front flap inside out around the back flap. To wash these, turn the whole thing inside out and rinse. Now that your creative juices are flowing, check out some of my other tutorials! This is amazing! What is the best way to clean these after using them? What if something get spilled on the outside fabric? Can you handwash it? Or machine wash delicate? I haven't tried machine washing it. I would recommend hand washing. It would be fine if you hand wash the outside too. Great job - I really need something to replace the baggies I hae to send my husband's meals in... I linked to this on my weekly roundup - thanks for sharing! You could use PUL (Poly Urethane Laminate) and make it completely machine washable too! Very cute!! could you use this pattern [fabric only] with oil cloth and just avoid the plastic bag all-together? as well as making it completely wipably-clean? Love this. I'll be using the technique to create a holder for PTR (paper towel replacements) that I'm making this year for next Christmas. Where did you find the freezer bags without the company logo on them? Oil cloth is not food safe. It's made of several chemicals. Katzber, Look for the gallon sized store brand bags... they usually don't have a logo. Hello, I discovered your blog through All Free Sewing and love the idea for the sandwich bags. I've added you to my blog roll! I LOVE this idea! I've seen these before but never using a real zip loc bag. Are they washable? In the washing machine or just by hand? Great tutorial! They are washable by hand! Hello, I love this and can't wait to make some! I have been reading on the web about fusing plastic grocery bags to create a usable plastic "fabric". Have you ever thought about using that for the inside of your Kitchen-to-go's? It'd be more green than buying the freezer bags, and should be food safe. I tried fusing plastic grocery bags and I had a really hard time with it. Maybe you'll have better luck! I would recommend using the freezer bags though because they are food safe. I don't know about the safety of the grocery bags especially after you melt them with an iron. I had been thinking about doing something like this when I found your tutorial. I was going to use an old Mylar balloon to upcycle instead of the sandwich bag...do you think that is food safe after washing? I would put the silver side up. I use cereal packaging bags for these. It's really amazing and strong. When you cut it open you have a nice large piece and it's free! I used some just yesterday to line the breast pocket on husband's new carpenter apron. It keeps his little notebook from getting soaked with sweat.. ugh. I planning to make a new wallet for him and use some of this for an inner layer. He likes the fabric wallets, so this should be perfect waterproof layer. I've also used it in make-up bags and they are great to throw in the diaper bag for little wet items. Best of all, they are free. I would NOT use mylar. I doubt that it is food safe and I have no idea of the chemicals that are in it. The cereal bags are completely safe and durable. However, I wouldn't put them in the dryer. I don't think it's a good idea to use a Mylar balloon. My rule of thumb is to use something that is already food safe (cereal bags are a great idea!) those companies have already run a battery of tests on the plastic the use to make sure it is safe. Not all plastic is created equal! Hi "Getting Fitter!" As others have said, don't use mylar! For a cheap alternative, look into safe shower curtain liners (food-safe and PCB/PVC-free). I linked to this post in my blog! Love your ideas on making fancy sandwich bags and snack bags. I would of never thought of using ziplock bags in any sewing projects. I recently remade a bag for my daughters leaf blower/vaccum and used a soft shower curtain as a liner for it to last longer then with just plain cloth. How do you think a shower curtain would work in these? While a shower curtain may work, I would stick to using plastic that you already know for sure is food safe. This is a stellar idea! Wow! I think I may try something like this soon. Very cool! Sarah, on the sandwich bag the flat bottom is about 2" when I finished my bag. What is the measurement of the top of your bag after a sandwich is inside and you have the top part folded over? I'm down to about 1/4". Seems like the top of thesandwich would be squished. Looking at my bag from the side, I got from the nice 2" at the bottom to just the fold at the top. Help! 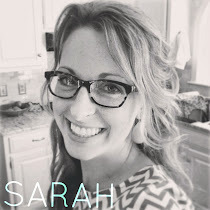 Your blog has to be the best I've ever found!! !